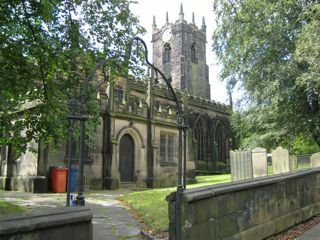 St Mary's church contains gravestones dating from the 17th century up to the 1860s when the municipal cemetery opened for new burials. Unusually the majority of the gravestones are ledger slabs, stones which are laid flat on the ground, and which even form part of the paving around the entrance. Many are intricately carved and are in surprisingly good condition. Those in the grassed areas are often partly concealed beneath turf so the full inscription is hidden. About 70% of the gravestones have been photographed and indexed. The remainder and those inside the church are still to be done. The GPR holds 185 grave and 552 person records for the burial ground.